This article may require cleanup to meet Wikipedia's quality standards. Please improve this article if you can. The talk page may contain suggestions. "We are deeply saddened to announce that Steve Jobs passed away today. 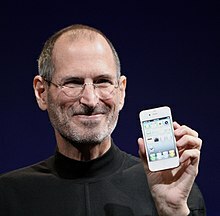 Steve's brilliance, passion and energy were the source of countless innovations that enrich and improve all of our lives. The world is immeasurably better because of Steve. His greatest love was for his wife, Laurene, and his family. Our hearts go out to them and to all who were touched by his extraordinary gifts"
↑ "Rare Pancreatic Cancer Caused Steve Jobs' Death" (Press release). Voice of America. October 7, 2011. Archived from the original on January 24, 2012. Retrieved October 7, 2011. All about Steve extensive & short biographies, pictures, movies & interviews of or related to Steve Jobs. YouTube video of first Jobs' Macworld keynote in 1997, when he returned to Apple, where he announced partnership with Microsoft. YouTube video of Jobs' commencement address at Stanford University, 2005-06-12. Text of Jobs' commencement address at Stanford University, 2005-06-12.